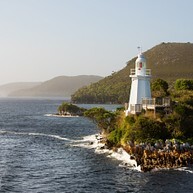 Population: In December 2012, Tasmania’s population was approximately 512,400. Opening hours: Most businesses open 9am-5pm, check ahead when travelling regionally. Detached from mainland Australia, the island of Tasmania offers a very different experience from your typical Australian holiday. There are luxurious guided walks into the wilderness, wild ocean cruises where you’ll enter sea caves and gaze at the tallest cliffs in the Southern Hemisphere, ocean kayaking, sailing, mountain climbing, bushwalking and wine tasting. The locals love to share stories of the island too. Expect ghost tours by candlelight, Aboriginal storytelling by campfires, and history that unravels as you explore mining towns and fishing villages of the island. 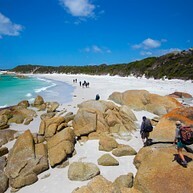 The Bay of Fires Walk covers a coastline where there are more extraordinary white sandy beaches than houses. Immerse yourself in the pristine coastal environment teeming with wildlife. Accommodation is uncomplicated and luxurious of either the beach camp or exclusive Bay of Fires Lodge, an airy seaside cliff top lodge overlooking the azure ocean and blazing orange boulders. Walk through the bush to the spa, beginning your spa experience with a soothing soak in the outdoor bathing pavilion. Climb over the edge of the railing and before you can say ‘geronimo’ you’ll be well into your 140 metres of adrenaline-pumping descent – the longest commercial abseil in the Southern Hemisphere. Take a two-and-a-half-hour city paddle with fish and chips, a day tour around Hobart exploring cliffs, caves and beaches, a multi-day expedition into the Tasmanian wilderness, or try an expedition amongst stunning landscapes as you glide far from the beaten paths of modern life. 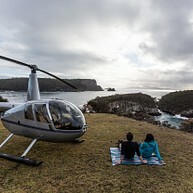 The Bonnet Island Experience departing from Strahan visits a tiny island at Macquarie Harbour on Tasmania's west coast. Cruise in comfort arriving on Bonnet Island just before dusk. Hear stories of shipwrecks, rescues, storms and survival. Visit a historic lighthouse, to learn how the keepers lived and worked, guiding ships into the harbour. The island is also home to a thriving colony of little penguins and short-tailed shearwaters. These amazing birds spend their days fishing at sea in all conditions, returning each evening at dusk, to their burrows on the island. Observing this phenomenon from close quarters is at the heart of The Bonnet Island Experience - a memorable and intimate encounter. If adventure, wilderness and action is that you’re after - head to the alpine reaches of Cradle Mountain and climb into a wetsuit. Cradle Mountain Canyons run trips where you jump, swim and abseil through ancient canyons. It doesn’t get much more Tasmanian than Cradle Mountain and Tassie devils. Keep an eye on the clock because the Devils@Cradle feeding tour happens at 5.30pm sharp – or the devils get mad. This is a rare chance to observe these unique animals in the company of some fellow carnivorous marsupials – the eastern and spotted-tail quoll. Riders worldwide are making tracks to Tasmania. Blue Derby is a network of trails that surround the town of Derby. Once the centre of a tin mining boom, these days it’s the mountain bikers carving up the dirt. Cruise to the top of the hill. Tear downhill as fast as you can. Repeat. 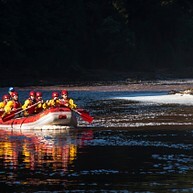 Be swept away on the King River Rafting adventure on Tasmania’s west coast. Your journey begins aboard the 118-year-old West Coast Wilderness Railway, Australia’s only steam train of its kind. With rafts atop and rafters aboard, the train will travel through remote rainforests and incredible landscapes to Dubbil Barril where your journey takes a rapid turn. Here you’ll swap comfort for courage as you plunge into the rapids of the mighty King River, which flows as fast as the adrenaline. Along the way, when the waters are calm, your guide will share stories of the region’s fascinating history. 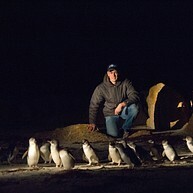 See wild little penguins emerge from the ocean and head for their homes in a natural rookery on an after-dark tour. Established by locals to protect the penguin population, the tour lets you get close to the penguins without disturbing their nightly journey. These are wild birds, so penguin numbers and arrival times vary with the life-cycle activity and weather, with larger numbers of 100 -125 birds from September to January. You can expect to get very close to a penguin on this tour. Tasmania is one of the last great wild fisheries. Glassy lagoons, remote highland lakes and freestone rivers provide seclusion and excellent dry fly fishing from September to May. 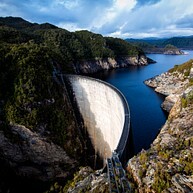 There are over 3,000 lakes, rivers and streams in Tassie. 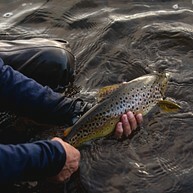 You’ll be excited to discover almost all of them hold wild brown and rainbow trout. The varied terrain also creates some pretty memorable challenges. 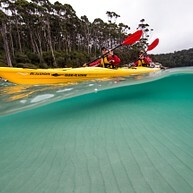 Sea kayak into the heart of Freycinet National Park – the contrasts are stunning. Pink granite mountains, sandy beaches and clear blue water. It is an engineering marvel, the world's steepest steam-operated railway. This is Tasmania's West Coast Wilderness Railway, and it is 28 tonnes of special. Today, passengers are moved by the same locomotives that began the run from Queenstown back in 1896. They take a comfortable 16-kilometre run through the wildlands, uphill through spectacular landscapes and down to a place called Dubbill Barrill, with stops for a little gold panning and sightseeing. These locos were originally built to move copper ore for the Mount Lyell Mining and Railway Company, delivering the mine's deep riches out of a massive, landlocked deposit at Queenstown to the port of Strahan, and from there, to the world. And every passenger is greeted by one of the line's original workhorses, a 28 tonne steam locomotive that's ready to roll – and guaranteed to raise a smile. 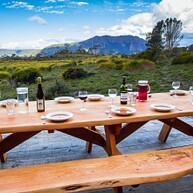 The Cradle Mountain Huts guided walk is a great opportunity to discover the dramatic landscapes and extraordinary diversity of the Cradle Mountain & Lake St. Clair National Park within Tasmania's World Heritage Area. Following the iconic Overland Track, the walk extends from Cradle Valley to Lake St Clair through a variety of spectacular landscapes. In the evening, relax in the comfort of private huts, enjoy hot showers and three-course meals. 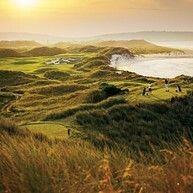 Barnbougle Dunes, a golfing destination on the coast of Bridport that’s been rated Australia’s number one public course more than once. Tee off to the sound of crashing waves on a links course where sweeping beaches, farmland and manicured greens mix effortlessly. Challenge yourself to 18 holes followed by a Tasmanian whisky in the clubhouse. 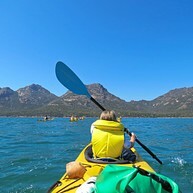 Leave everyday life behind for the Freycinet National Park. Each day a new adventure unfolds as you access the most isolated corners of the park. Snorkel clear waters, walk to magnificent views and walk the powder white sand of Wineglass Bay under the Hazards mountain range. At night enjoy hot showers, deep baths and wine by the log fire. Peruse the lodge’s library, watch wildlife and enjoy indulgent meals prepared by your hosts. Renowned for its flights into the Southwest National Park, a vast and special place of extraordinary natural values that forms part of the Tasmanian Wilderness World Heritage Area, there’s often more to a scenic flight with Par Avion. Fancy whisking that special someone away to devour oysters and wine on a picnic by the sea?